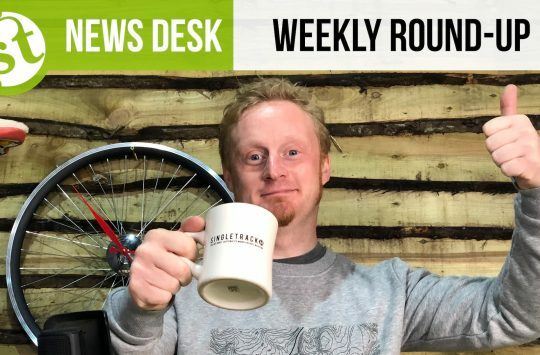 Our very own in-house office wildebeest, Rossco, has been playing about on the new Murmur Factory from Starling Cycles. With its slender steel tubing and progressive frame geometry, would it challenge Rossco’s preconceived ideas on what numbers are ideal for riding a bike over all of the mountains? Over to the man himself for the full review! 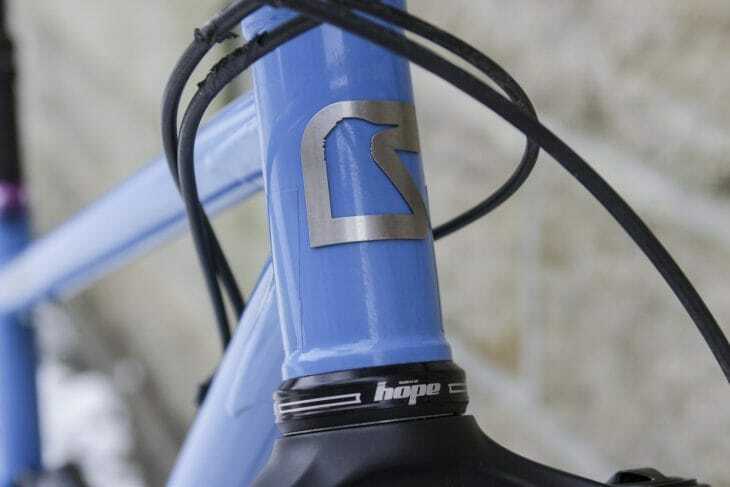 Starling Cycles has been around for about five years now, having established a reputation for producing simple, elegant, steel full suspension frames. 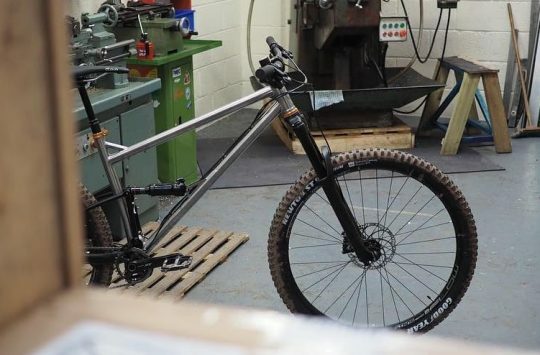 Started by Joe McEwan, a structural analysis engineer from the aerospace industry, his part time passion for designing and building bikes soon took over from his day to day job. As demand has grown for his custom frames, he recently made the move out of his ‘bottom of the garden’ shed workshop, to a purpose built industrial unit in order to keep up with demand for his UK made custom frames. Unlike a lot of other bigger, mass produced brands, Starling doesn’t have a raft of models covering every individual niche and trend in the current market. Rather, McEwan produces two main models with similar intentions – one based around 27.5in wheels, and one using 29in wheels. The Murmur is the bigger wheeled sibling of the two, and is designed as an all-round trail riding, enduro racing do-it-all machine. 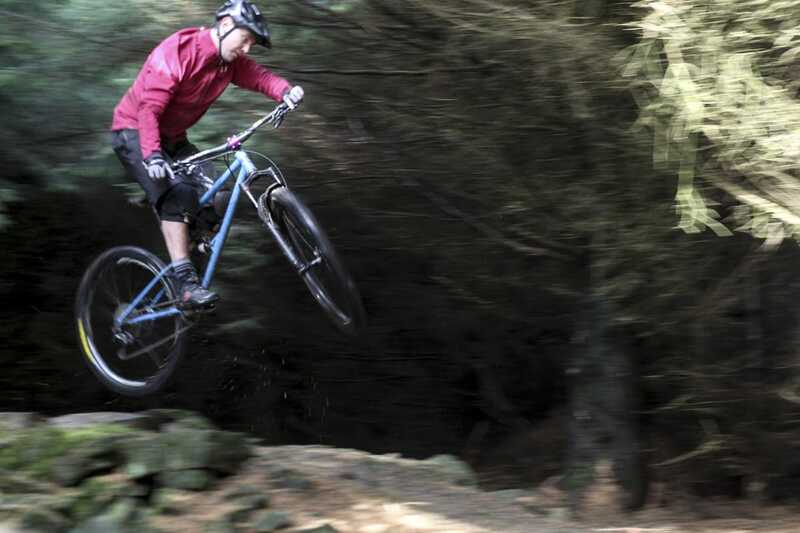 With a long reach, steep seat angle and slack head angle, it certainly looks the part on paper. Nice, neat, understated graphics add to the clean look of the steel tubes… and bottle bosses for the win! Up until now the Murmur has been entirely UK-made. But that’s all about to change. Having determined the most popular geometry combinations from his custom builds, Starling is launching the Murmur Factory. Available in just two set sizes (small & large) with predetermined geometry, the Murmur Factory will be manufactured in Taiwan. 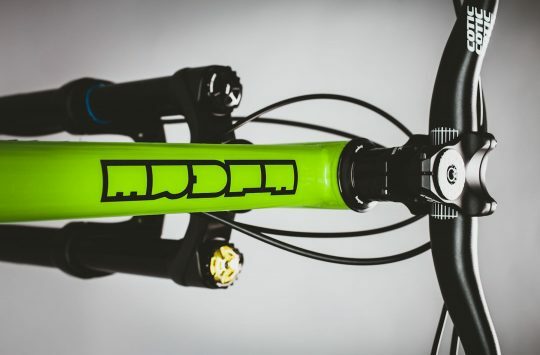 Designed to be a more affordable option of the UK-made frame for those less concerned by custom geometry, the Murmur Factory will also provide drastically increased supply over the custom frame options. Colour options are yet to be confirmed but McEwan has mentioned that will be a range of colour options coming. Let’s get this straight first: I’m a fan of big wheeled bikes. It took me a while, but around 10 months ago I started trying a few more ‘modern’ geometry 29in bikes and was sold. Geometry had moved on and all I could see were benefits to big wheels, where in the past I’d seen negatives. Up until this point though I’d been happy with certain numbers on a bike, but with all the ‘longer, slacker, lower’ hype I was keen to try out a longer (for me) reach and see if bigger really was better. 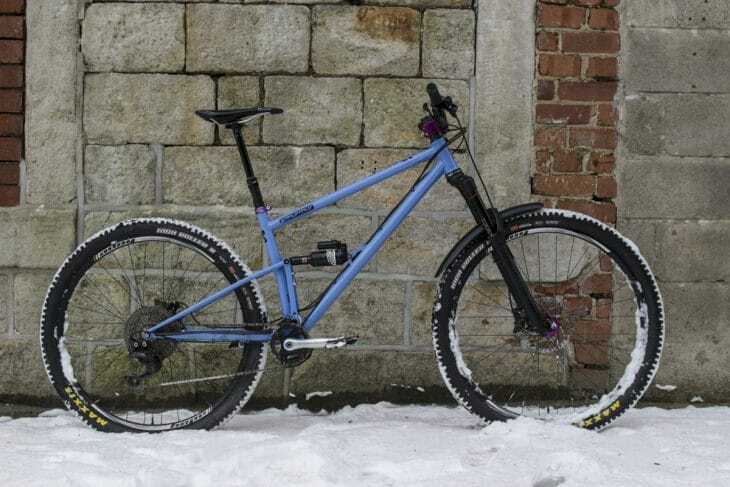 Add to this the current trend for steel full suspension bikes and the fact that I was already riding a similar travel 29er, and I was chomping at the bit to see what the Starling Murmur Factory would be like out on the trails. Built out of a combination of Reynolds 853 and Taiwanese heat treated chromoly steel tubes, the biggest difference of this frame to the UK one is that it is TIG welded (the UK made frame is brazed). McEwan says this gives the frame the same compliant steel feel, but can be produced at a cheaper cost, with the savings passed on to the consumer. The steel tubes give the bike an elegant look, which is exaggerated by the slim tubes and the parallel line between the top tube and seat stays. 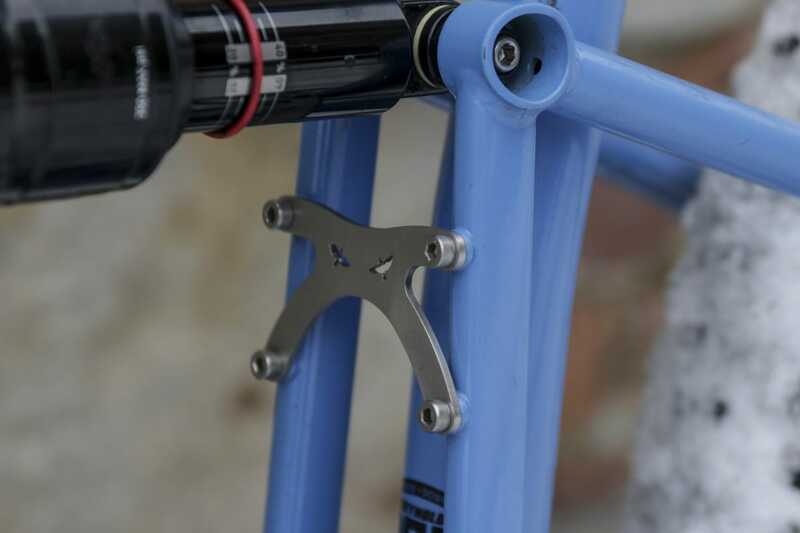 Like the UK-made custom frames, everywhere you look on the frame there are really neat touches, including chamfered pivot bolt housings to increase clearance, a laser cut brace on the swingarm, and an integrated chain guide mount. Couple this with other more practical features such as ISCG mounts, bottle cage bosses, a replaceable mech hanger, external cable routing and a threaded bottom bracket (yes, that’s a feature I’m happy to include!) and you’ve got a really attractive frame package. Them’s some good looking numbers! But onto the numbers. As mentioned, up until now I’d kind of settled on some rough figures in my mind that I thought best suited me. The Murmur pretty much goes bigger on all of these. Stand out numbers for the large size I’ve been testing include a 480mm reach, 65° head angle and a 77° seat angle. This is all coupled with a decent 445mm long rear centre to give stability at the back. 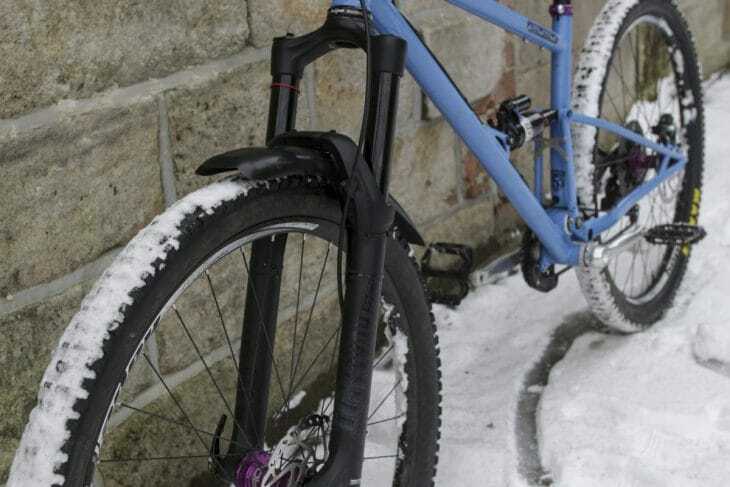 The Murmur uses a simple single pivot design to deliver 145mm of linear rear ravel. 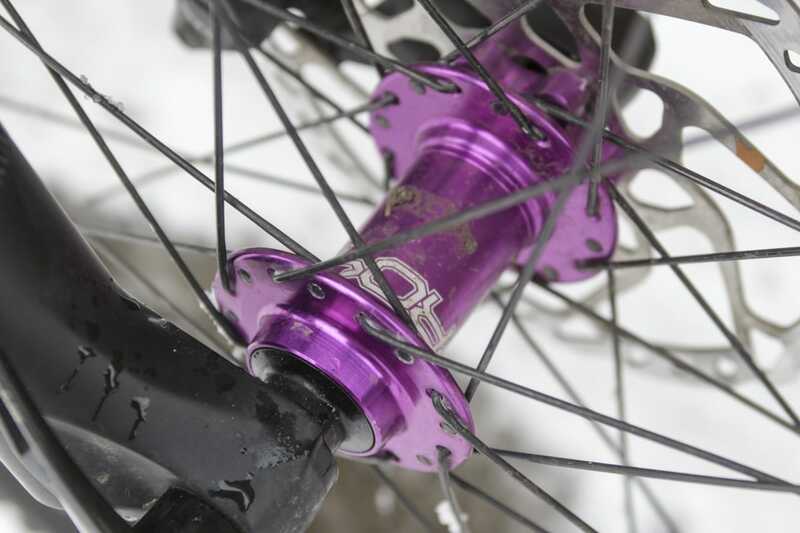 This is based around two Enduro cartridge bearings pressed into aluminium inserts that pivot around an oversized axle, situated just above and forward of the BB shell. 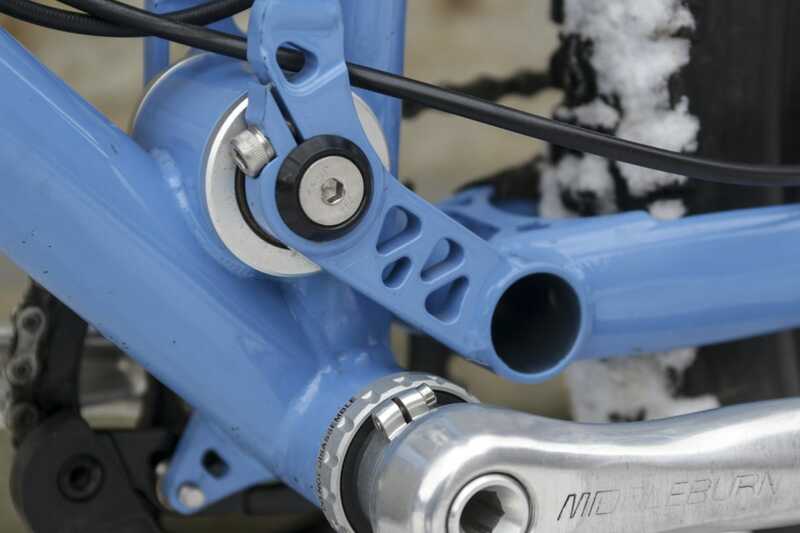 This pivot also falls exactly in line with a 32mm chainring which is no accident. According to Starling, this placement gives “the most balanced anti-squat / rise behavior through full travel”, basically reducing pedal feedback and chain growth. This design gives a linear suspension platform designed to make the most of modern air shocks and the ramp up provided towards the end of the stroke. The bike we’ve tested here came fitted with a RockShox Monarch Plus M/M tune in a 200x57mm size, though production models will be based around Metric shocks and will deliver a slightly reduced travel of 140mm, but with the same linear platform. Up front there’s a 2018 RockShox Lyrik RCT3 taking care of business, delivering 150mm travel to match the rear. This offers a stiff 35mm chassis with more than enough adjustability for me, including rebound and low-speed compression adjustments, as well as the Bottomless Token system. Although the Murmur is essentially offered as a frame only option, Starling does offer build kits so you can build your dream bike yourself at home. 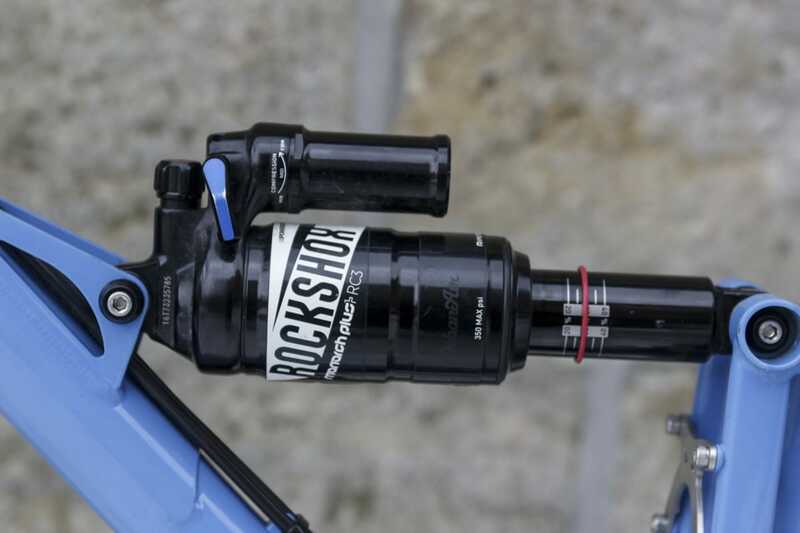 Working with a lot of the top names, you can spec kit from RockShox, DVO, SRAM, Shimano, Hope, Middleburn, Maxxis and finishing kit by Burgtec. 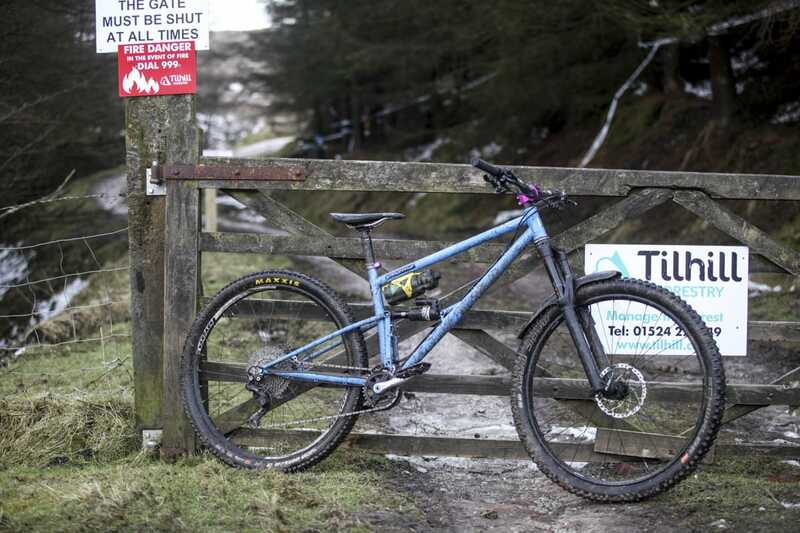 Our build came spec’d with Hope Tech Enduro 29er wheels shod with Maxxis High Roller II tyres in a 2.3in flavour, along with a reliable Shimano XT shifter & mech, and SLX stoppers paired to 180mm rotors. 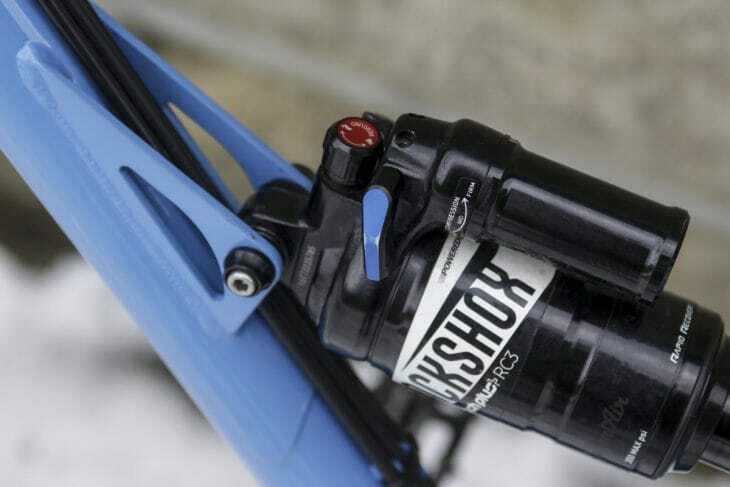 The seatpost is an internally routed RockShox Reverb dropper with a 1x remote and 150mm travel. Finishing kit was courtesy of Burgtec with 800mm wide Ride Wide Carbon Enduro bars, Bartender grips, a Cloud saddle and a dinky 35mm Ranger stem in pimp anodized purple (to match the Hope purple anodized hubs and seatclamp, of course). 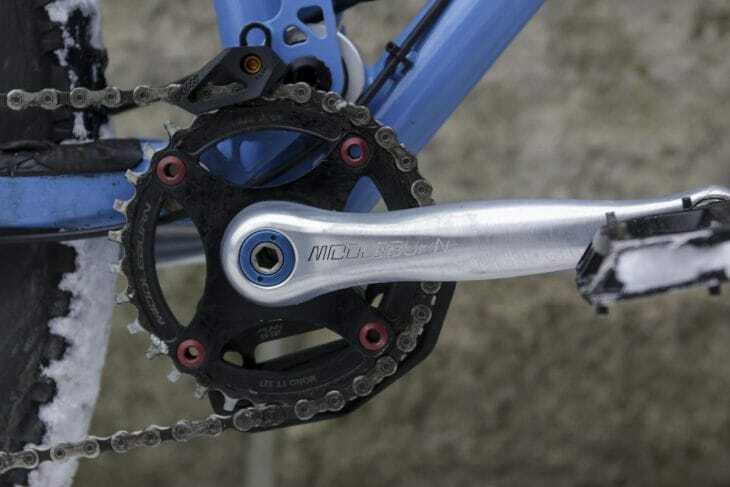 Other nice touches include the Funn chainguide and bash guard, and last but not least are the beautifully made Middleburn cranks. 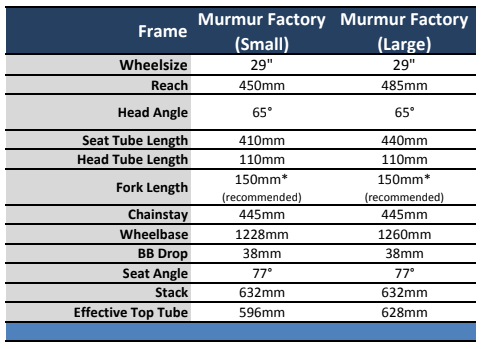 As already mentioned, this large-sized Murmur Factory is a bit bigger than bikes I have been currently using, with an extra 20mm in reach than my personal bike. Getting on the Murmur, initial impressions were good. The additional length didn’t feel alien or too long as I was concerned it might. The saddle position was fairly neutral with the clamp in the middle of the rails and the saddle pretty horizontal, which is how it’s stayed. The 800mm wide bars are a good size and in proportion to the bike, and well suited to its enduro intentions. 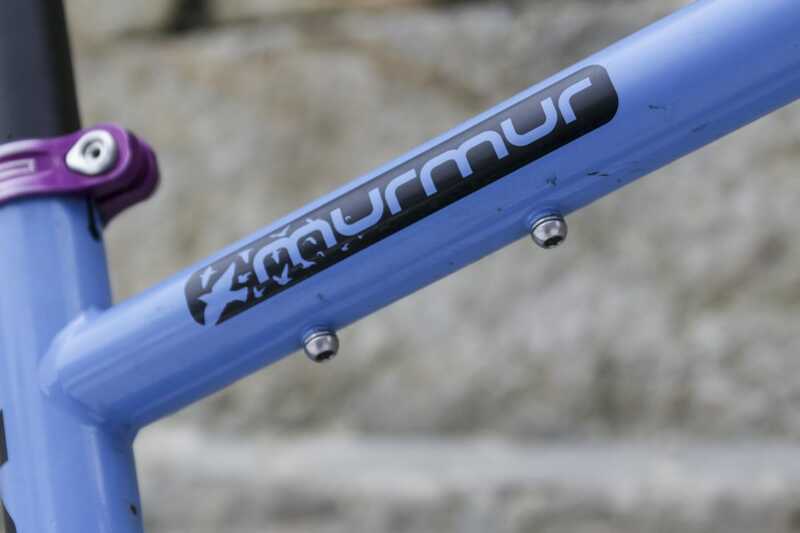 The Murmur Factory is a fun bike..!! I initially set the fork and shock up with about 30% sag on each; nothing too complicated to start with, just a bit of air and set the rebound. I found I wasn’t getting full travel from the fork and it was actually feeling slightly harsh over repetitive and bigger hits. I dropped all the air out and removed a bottomless token leaving two in there, then went back up to 75psi. This definitely improved things but was a little too soft in the initial part of the travel. 80 psi then and a couple of clicks in on the low speed and things felt good. Setting the shock was pretty much a case of adding air to get the right sag. I went up to 235 psi which was just under 30% sag but again I wasn’t using all the travel. Dropping just 7 psi out of it helped a lot though, and things have been much better. One thing of note with the rear shock on our test bike is that I’ve been running the rebound just a couple of clicks from the fastest setting in order to get it feeling how I’d like. Any more and it just felt too slow on fast rough stuff and for popping off things. Getting on the bike for the first time, one thing I noticed straight away was the seat angle. At 77° it is quite a bit steeper than I’m used to, and coupled with the longer reach, gave a very different seated position than other bikes I ride. 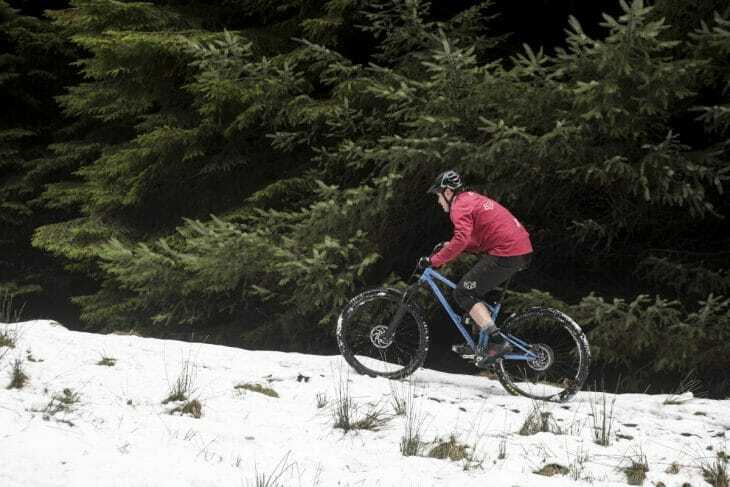 I was also coming off the back of two weeks illness when I first rode the Murmur, and slightly heavy legs and a different climbing position had me questioning the all-round capability of the geometry. Once I’d gotten through that initial ride and adjusted to the different position though, I was really impressed with the way the Murmur climbs. 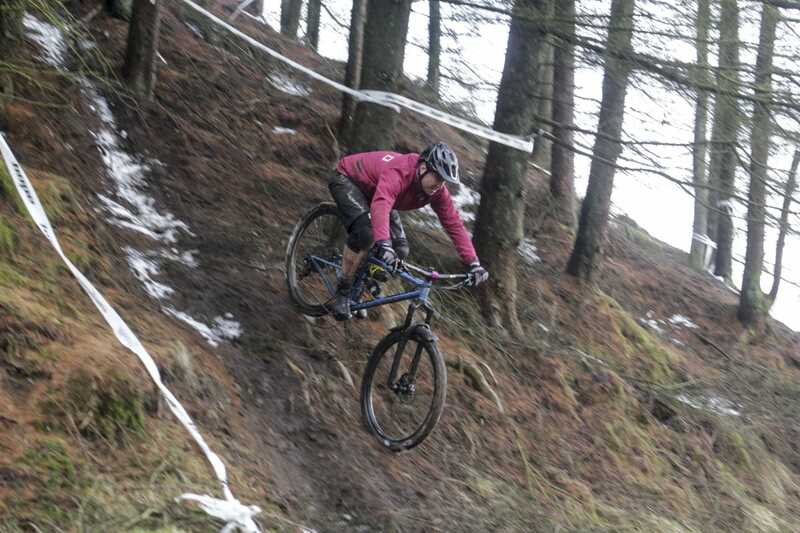 I’m certainly no XC whippet (I prefer uplift to epic), so being described as ‘like a mountain goat’ by a riding buddie came as a bit of a shock. 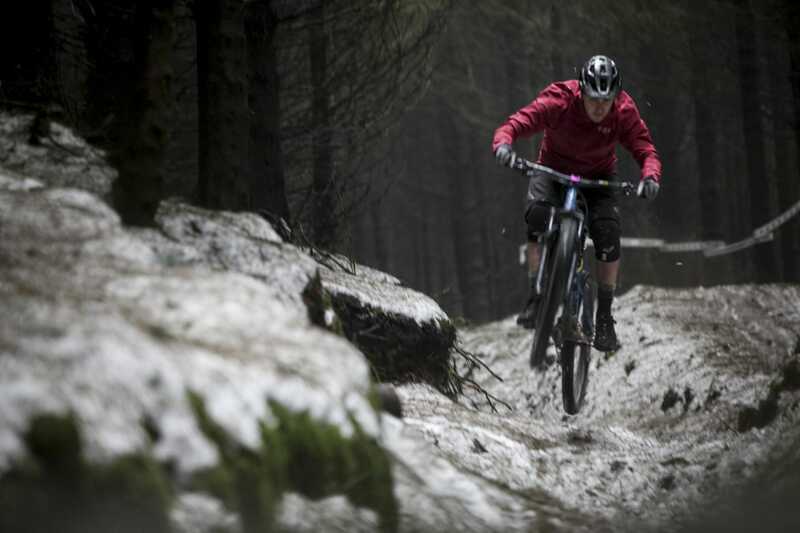 The bike seems to easily claw its way up steep, loose and techy climbs without issue. 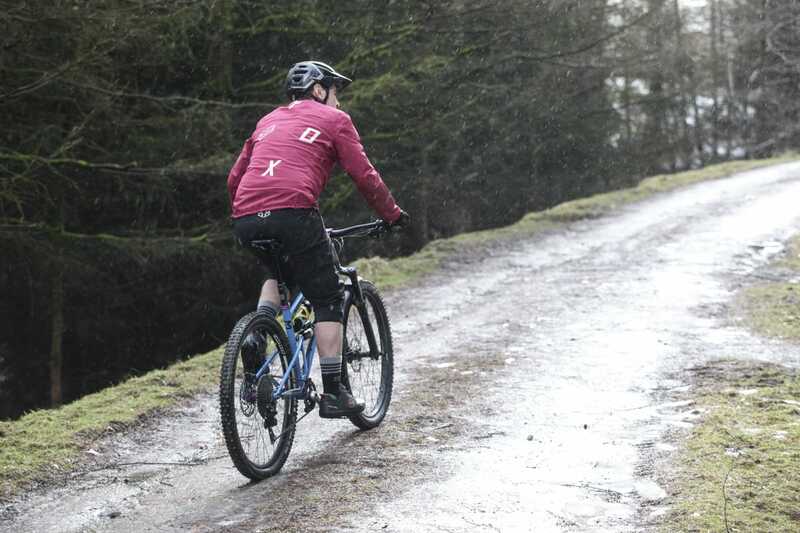 A combination of the long reach helping weight the front, and good length chain stays out back combined with a sorted suspension platform mean that you can easily spin up techy climbs without losing traction or lifting the front. Although the shock does have three different compression settings for climbing etc., I’ve so far not felt the need to move it from fully open, with no discernible bobbing when climbing. Yes, it’s pretty long on the front for super tight stuff, but I’ve not found it to be overly wandery and just a case of adjusting my normal riding position to get round the tighter bends on the trail. On more gentle, ‘sit down and spin’ climbs, again no issues. I’ve had no noticeable bob and the big wheels just keep rolling. 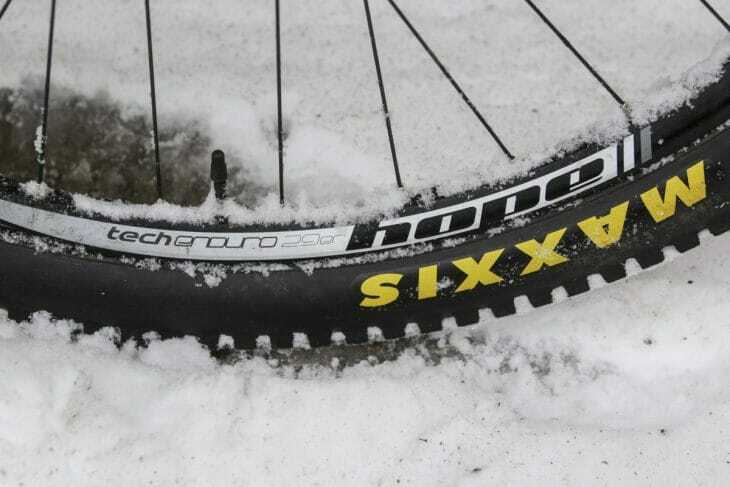 Obviously compared to an out and out mile munching XC machine it’s not going to win any medals. But that’s not really the point of this bike, and for its intended use it does a more than adequate job of getting you to the top in an efficient manner. Once the terrain starts pointing down and you’ve got a bit of gravity on your side is where I’ve really been impressed by the Murmur. On more rolling, flowy terrain, the stability of the bike lets you get off the brakes and concentrate on pumping every rise and compression, eking out as much speed as possible from the ground. Every time you pump the ground, the suspension feels like it’s on your side, pushing you on rather than sucking precious momentum from you. Just a few cranks to get the big wheels going and the bike seems to carry speed easily, getting up to full chat quickly. Once at speed, it’s a case of staying off the brakes and letting the bike do its thing, allowing you to pop off previously unseen lips and look for every shady line possible to see just how far you can push the stupid amounts of grip that you get from the big wheels and sorted suspension. When things start to get a bit rocky and rowdy, it’s business as usual. The well-balanced front centre and chainstays allow you to commit to a line through rough terrain and adjust as needed. Then things get steeper and techier, and the Murmur seems to step it up a notch again. Thanks to Havok Bike Park for the photo shoot location. 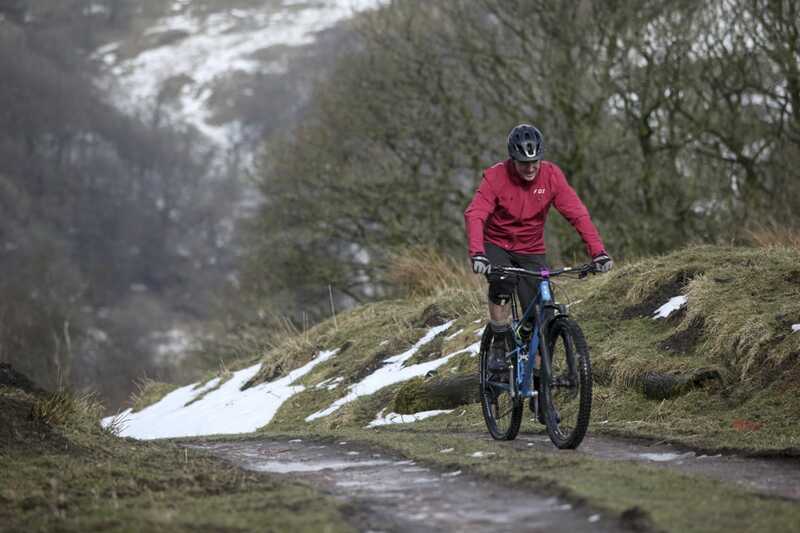 With the longer reach paired with good length chainstays, I’ve found myself staying more centred on the bike when attacking steeper, techier trails, rather than having to push my weight further back. And this is the key to its descending ability. 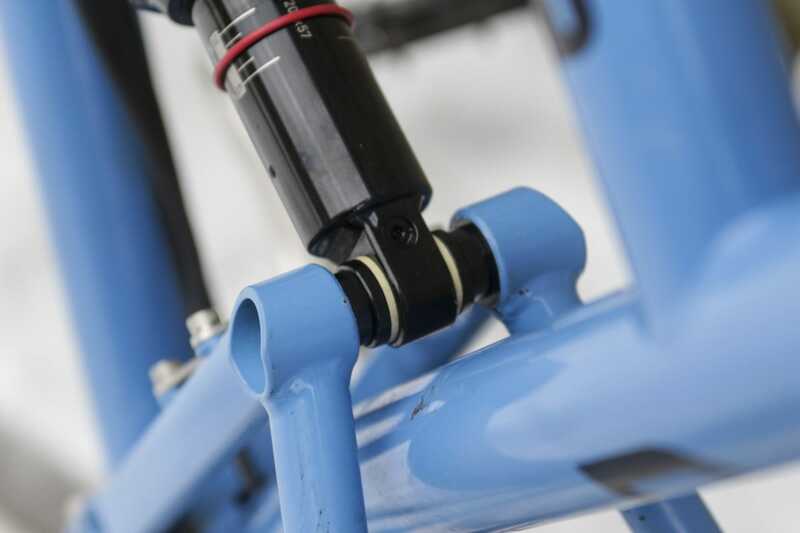 The low bottom bracket, coupled with the longer reach and slack head angle mean you feel like you’re sat in the bike rather than perched above or having to hang off the back, which is emphasised by the reasonably low front end and low rise bars. 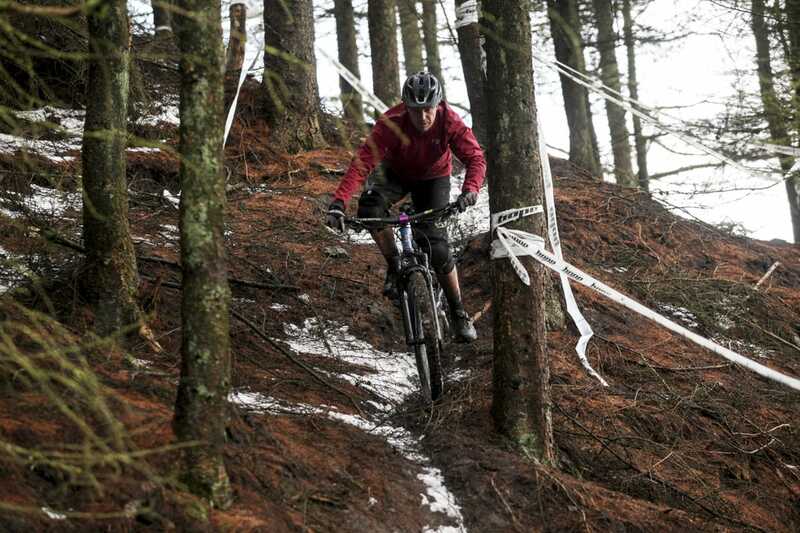 Point it into any steep rut that you like and it laps it up. 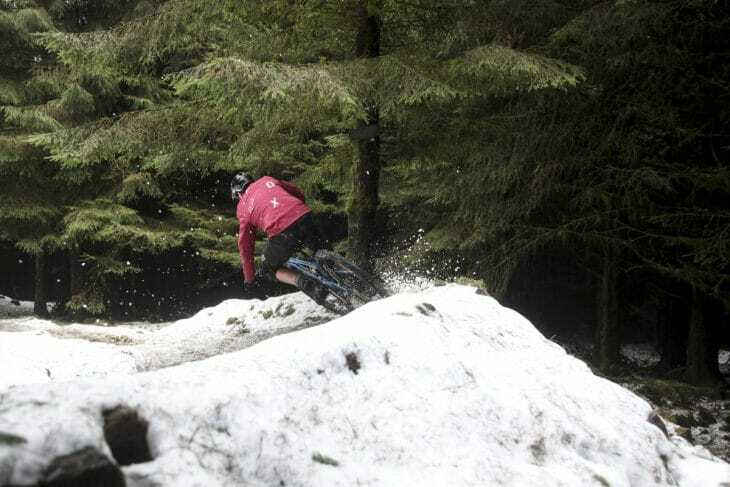 The centred weight distribution and sorted angles give you the confidence to point it into a super steep chute and catch berm knowing that the front will stick and get you round, with the centred position allowing you to adjust your weight to push through the turn to bring the rear round. 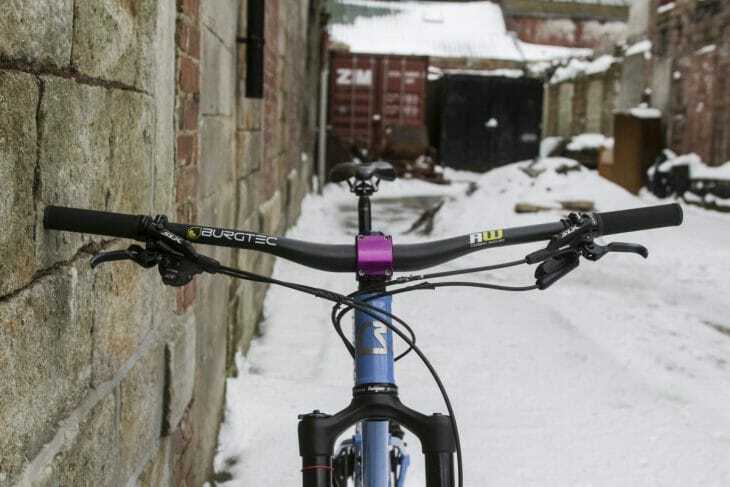 The inherent flex that you get from a steel frame (there was evidence of chainstay tyre rub, but there were numerous under tensioned spokes in the rear wheel and production models will have greater tyre clearance) just adds to this feel of being able to push into steep tight turns and get round them. I had a couple of issues at the start of the test that hampered my initial rides (Reverb and rear brake issues) but as the Murmur is really only available as a frame-only package with options to buy components, rather than a fully built bike, I don’t really want dwell on those points. One point of note is that I did have to change the lower rear shock bushing after only one ride. 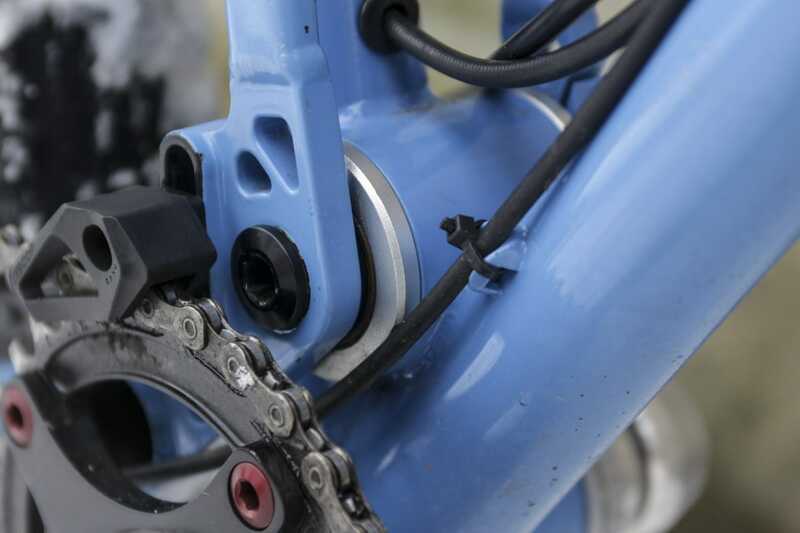 I think this was more down to the fact that the bike had been ridden quite extensively before coming to us, rather than a true reflection on the durability of the frame itself and I’ve swapped the bushings with no issues. The only thing I changed out of personal preference was the front tyre. Although the High Roller II is a great tyre in its own right, with the majority of my riding involving steep, muddy rutted tracks, I wanted something a little spikier and bigger on the front so used a Magic Mary in Addix Soft compound tyre for the entire test period. Long, low and slack… pick three! All in all the Murmur is one of the best descending trail bikes I’ve ridden. 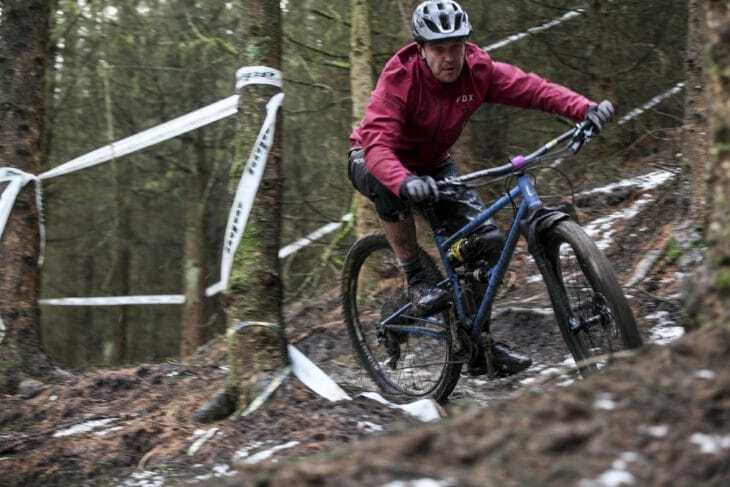 It doesn’t matter whether it’s a flat out rooty, rocky smash fest, or a mega steep, slithery, rutted woodland plummet – it just loves it and gives you the confidence to push on. 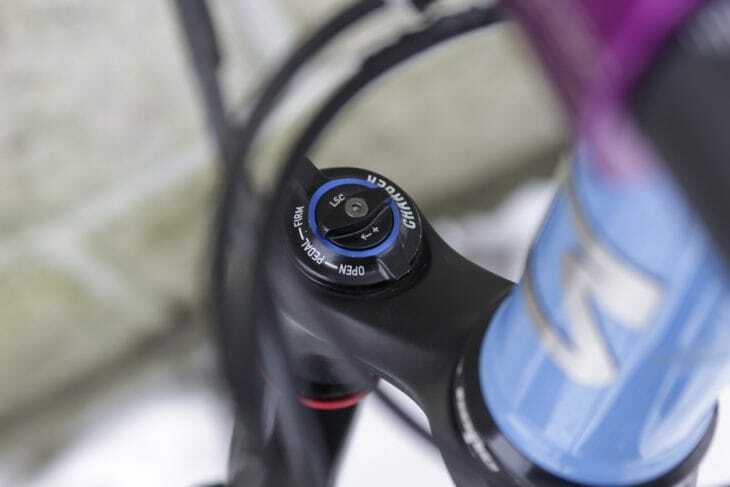 Add to this the fact that it climbs reasonably well for such a capable descender and can easily enough bash out the miles and you’re on to a winner. The geometry may not be for everyone, but for the style of riding I like, the Murmur is hard to fault. I like it and hope it’s sucessful as Joe seems a great bloke, but can’t help but think it devalues the crop of superbike status worthy custom frames. Would have thought the USP was that they are handmade in Brizzle not churned out of a Taiwanese factory? USP is great riding bikes. They are certainly not ‘churned out’ of anywhere. Taiwan allows Starling to build more custom frames for those who need custom geometry and gives me more time for exciting projects that will move the company forward.